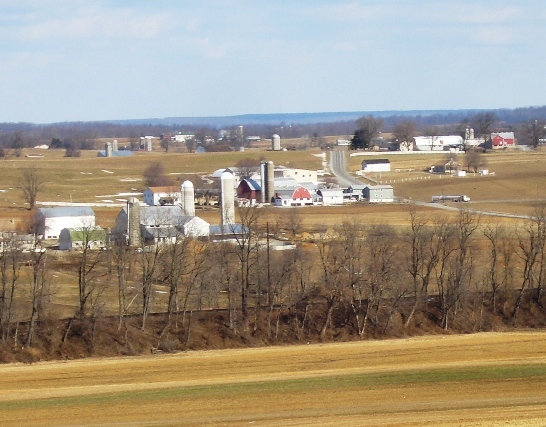 About a month ago I shared 10 views of Lancaster County. Thanks Lois! 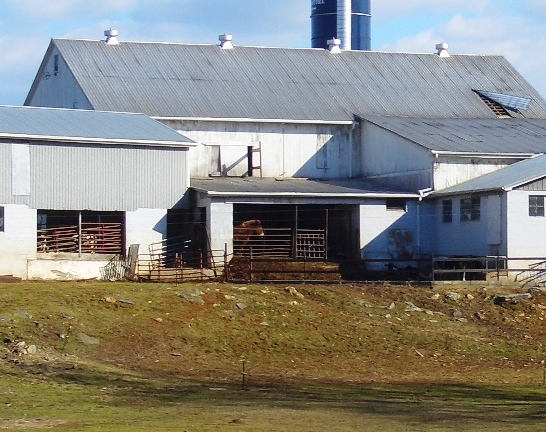 Lancaster farms do have the reputation for being tidy and well-kept. Many homes have landscaped yards as well. I really enjoy the pictures. Any chance we might be able to see the inside of an anonymous Amish home??? A real one, not a tourist remake. Absolutely gorgeous!!!!! Thanks for sharing, I really enjoyed them!! Very nice! I was just there a few days ago and, although it was pretty cold, everything was gorgeous! Have you ever driven on Georgetown road right off of Esbenshade road? 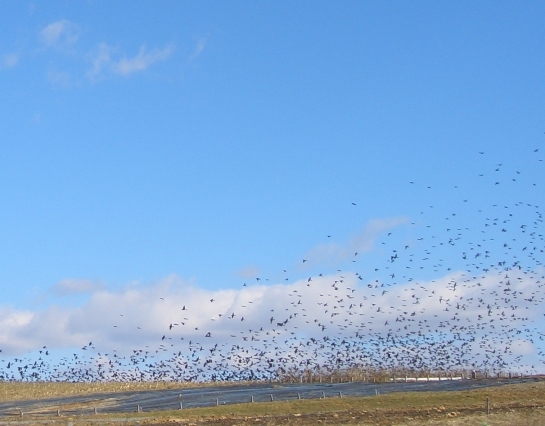 It’s right outside of Strasburg, I think. 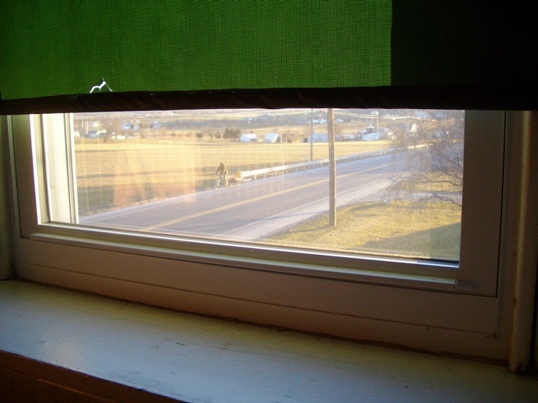 Oh my gosh, it’s an amazing view. Pictures of that would be so beautiful! 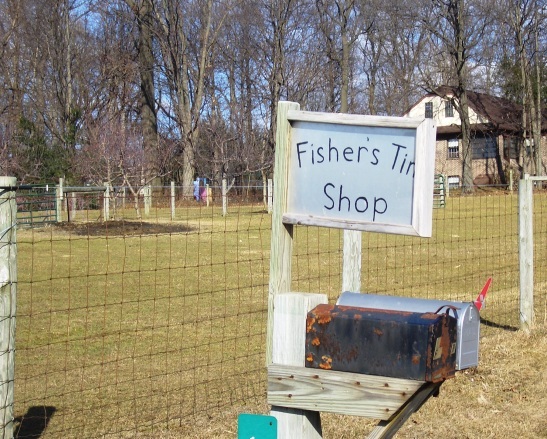 What do they make at Fisher’s Tin Shop? It looks like an interesting place to stop if possible. Have you ever been to Miller’s Health Food Store in Lancaster? If you haven’t, check it out sometime. I really enjoyed those pictures. In our area we have Mennonite and Amish. You can always tell their farms from the Englishers. 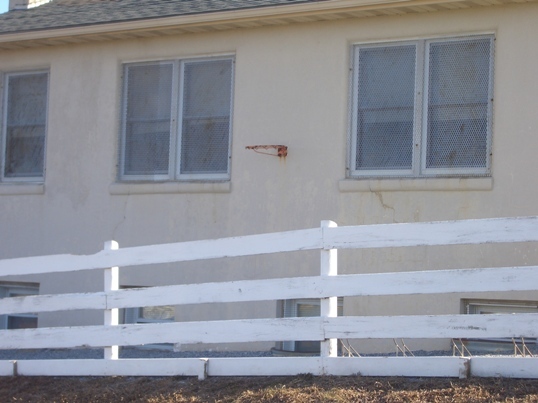 The Amish and Mennonites farms are all kept painted, yards in beautiful order, farm equipment and buggies are clean. 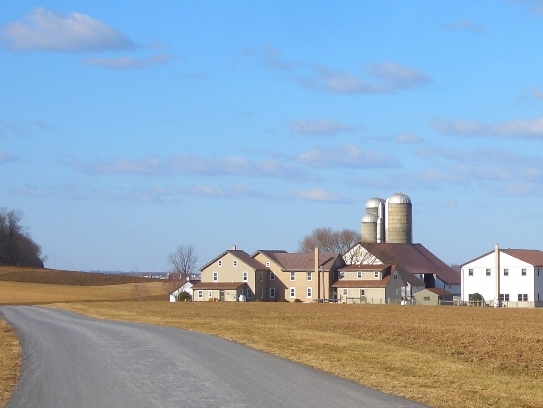 Most of the Englisher’s don’t keep their farms as upkept as the Amish and Mennonites. Wonderful pictures of beautiful settings. It’s nourishment to our eyes. Thank you. Great pictures, Erik. Thank you so much for sharing them with us. By the looks, you have had some wonderful travels around the Amish areas. Kathy, Dana, Marilyn, Emma, Robin, thank you. I keep saying I had a great day that day. You have to count your blessings. Terry, you know what you’ve got me stumped. I do not know–I did not interview these folks for my book nor did I have time to drop in; I could guess but I don’t want to tell you wrong. Maybe someone who reads this will know. I have been to Miller’s Health Food Store, nice place. Emma Esbenshade Road area is beautiful. Lot of great spots like that scattered around the County. Marilyn I think you’ll often find that the case. There are also groups that will have a lot less tidy yards though. Just a different emphasis. I’ve been there so many times now that just about all of the places in your photos are very familiar. Everytime I’m going to Lancaster everyone always says “oh, are you going for the outlets?” NO WAY!!!!!! !I don’t even go near them and truth to tell I actually resent them being there. So many people think that’s all there is to Lancaster. If they’re really interested I tell them to get out amongst the backroads and the farms where the real life and beauty resides. And no matter how many times you might ride along those same backroads you always somehow manage to see something new, different, adorable, comical, or just plain awe- inspiring. 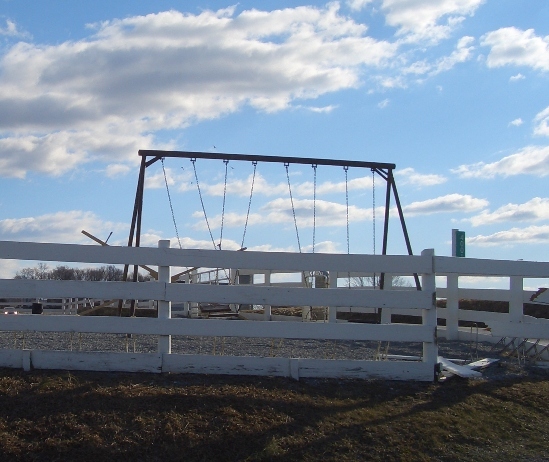 The picture of the swing set immediately made me think of a caption in my head that says “but when the children were away the cows would be at play” I can imagine mischievous cows playing with the yard set on the barnyard. I would imagine that Fisher’s Tin Shop would make decorative pieces for their brethren and neighbors, tin mail boxes maybe (maybe they made their own), any number of home items that a traditional family using some of the old ways might require, maybe they go truly old school and make pie chests or whatever so the air can get a the food but the rodents can’t, you’d punch holes in to tin in a pattern and then do some wood working around it. 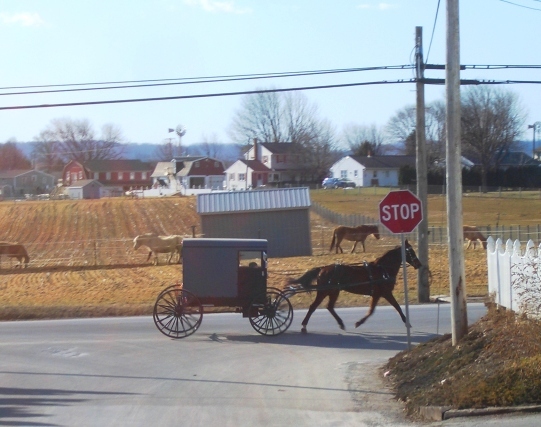 There is probably a whole world of things an Amish can dream up to use with tin, our non-Amish culture has forgotten a lot of what we used to do before electricity and refrigeration to name but one. Dear Shom (Shlightly-handled-Order-man), the Fisher tin shop is advertising: dust collection pipes & fixtures, costum-made stove pipes, custom duct & sheet metal work, stainles steel dishes & drain trays, and all stainless steel ice box coolers. Are you familiar with antique tin techniques? Meant to also say Thanks Erik for the wunderbar Amish America Website. My parents’ families are all born and raised in Harrisburg and surrounding area. I was born there but didn’t get to grow up there because Dad was military. Funny thing is, our family food, colloquialisms, and other mannerisms (“look here once…or…come here once”) reflects a tidbit of the PA Dutch culture, and I love it. I have thought about one day moving to PA to retire. But that is up to the Lord. Gisa thanks for the info, I wish I had stopped in at this shop. Next time. Shom I’m ignorant on tin but you are probably right. Gisa, that is different than what I guessed they would do, but it is still pretty cool that they do it. I’ve learned how to punch tin in an over simplistic manner (mainly for visiting children, but parents and other adults take interest in the examples I’ve shown, tin lanterns, etc) for simple decorations as part of a heritage demonstration event I’ve participated in, I don’t consider myself an expert. I mentioned a pie chest or something, I saw this on an American episode of the Antiques Roadshow, and it was quite elaborate, the wood working and the tin work, all designed to keep pies and other goodies open to the air but away from rats and sneaky children in the old days. Erik, I don’t know if the Amish would, but I’ve seen people cook with tin ovens over an open outdoor fire, I think. The first Amish school picture is definitely Hollow School. It is one of, if not the only one room school with a basement. I taught there 4 years, but would need to get out my school quilt to be sure of the years. When I taught there, the scholars played in the basement on rainy days and those who had rollar skates brought them along. They have since made it a 2 room school with lower grades on one level and higher grades on the other. The school playground photo is also at Hollow School. I spent 4 great years teaching there and don’t regret a minute of it, even when the children played jokes on me. They were a joy to teach! 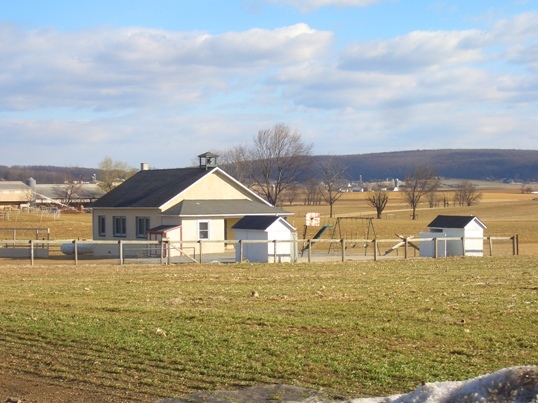 If you are talking about the Hollow School near Intercouse, PA, my mother went there in the late 20’s early 30’s. I remember her showing me the school, but I have forgotten where it is located. Can someone give me the location? I have a photo of her and some of her classmates eating lunch outside on the school yard under a shade tree.